have to be cooked long at all. I used to buy corn from the grocery store and boil it for 10 – 12 minutes, which seemed to be adequate. I totally ruined our first batch of local corn by overcooking it by a long shot. I only boiled the second batch for 3 minutes and it was still overdone! I guess the third time really is a charm because I finally decided to boil the corn for 1 short minute and it was perfect. So keep a close eye on that pot if you use fresh corn too. I also want to mention a little something about the beans in this recipe (or any recipe that calls for beans). I used to always buy canned beans and think nothing of it. Now that I am actually reading the ingredients I have realized the advantage of dried beans – no added salt! Isn’t it odd that a bag of dried beans has 0 mg of sodium, but a can of the very same beans would have hundreds of grams of sodium in it? I will be the first to tell you that it doesn’t always work out for me to remember to soak the beans the night before, so I like to have a back-up can on hand (since it is a whopping 99 cents extra) just in case I forget. I am happy to report though, I just learned that the Earth Fare brand of canned organic beans have incredibly low sodium (maybe only 15 mgs…but don’t quote me on that) so next time you are there stock up on some of those for sure! This would also make a great dip! 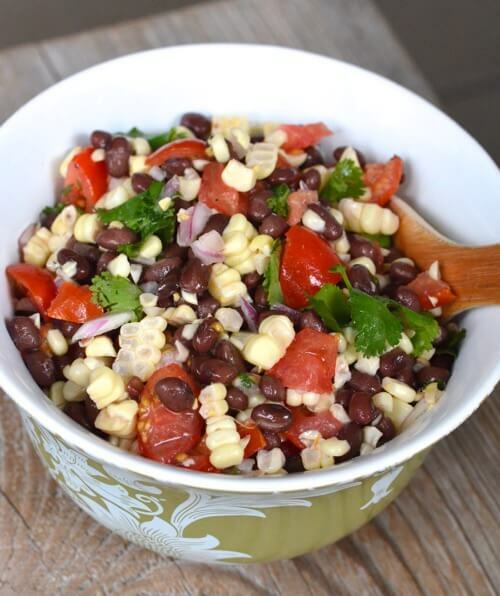 Cut the corn kernels off the cobs and gently mix with the beans, sliced tomatoes, and red onions in a large bowl. In a small bowl whisk together the basil (or cilantro), vinegar, oil, garlic and S & P.
Pour the dressing over the salad mixture and gently blend it together. Garnish with fresh basil (or cilantro) leaves and enjoy! If you rinse the canned beans then it gets rid of most of that added sodium, just so you know (in case you have to use that back up can). Good to know…I learn something new every day about all of this! Tried a take on this recipe last night. Served it over salad greens (which I know you’re not a fan of really…!) and had some flaked salmon on top… It was really good! I think my hubs had more this morning w/ his eggs… :) Thanks for sharing a great recipe! Oh that sounds like a good combo and my husband would love that too b/c he is really into salad greens AND salmon! Thanks for the comment Kristi! Love your website! Thanks for helping all us moms who want to eat healthier, less processed or non-processed foods. And as a note , Eden Organic canned beans (plain – different varieties available) have no added salt. :) Yeah! Good to know…and thanks for your comment! I’m going to make this tomorrow for the beach. But I’m going to throw it in a pita or maybe tortilla. I already copied and saved this recipe. It’s going in my recipe binder! :) YUM!! Keep in mind that if you have to make beans one day, you might as well make several big pots at once. Then cool the beans and measure them into ziploc bags for the freezer. :) I think a little over 2 cups is about what’s in a can….but can’t remember for sure. I love this salad! I have been making it (or a variation of) for years as my go-to dish for parties. Always a crowd favorite! I love to add sliced avocado and a squeeze of lime to add an extra layer of goodness. Also, leftovers make great topping for fish or tacos! Great summer dish! Thanks for sharing!! I batch crockpot cook beans then freeze them in cup sized portions. Then they are convenient, because I am a bad planner on having beans soaking at the ready. Canned beans also contain BPA, unless they specifically say they don’t, it’s in the lining of the cans. Eden brand foods has BPA free beans, but it’s unlikely to score those for $.99. Looking forward to making this! Thanks for the inspiration! I think I too will make a cold veggie salad for my cookout tomorrow. Sounds good! I can imagine dicing all the veg, and tossing it all with some cooked quinoa or brown rice and making a sort of tomatillo dressing to mix in it! Nom nom!! Great recipe, I can’t wait to try it! I live outside of the US and beans are a staple in our diet. We eat beans several days a week and love them. I never ever buy canned beans (in fact, canned beans aren’t even available here) and always cook them from scratch. Don’t worry if you forget to soak them overnight, it really isn’t necessary. In fact, I haven’t soaked my beans overnight in a couple of years. What I do is wash them and put them in a crockpot in the morning with fresh garlic, tomato, onion, green pepper and seasoning (and plenty of water, of course). I set the crockpot for 9 hours and the beans cook slowly throughout the day without me having to worry about them and are nice and soft and ready to eat at dinnertime. We serve them with rice and like to top them with fresh cilantro and lime! Yum and cheap! I am going to have to try this with my beans…thanks for the suggestion! I never soak mine overnight. I do the “quick soak” method shown on the bag of beans. It takes about 2.5-3 hours total that way (an hour of it is soaking). I also make extra beans and put them in pint size mason jars and freeze them. A pint mason jar is equivalent to a can from the store. Oh, and you can always take the leftover beans and put them in the blender to make refried beans. We serve refried beans for breakfast with fresh eggs and a serving of homemade raw milk cheese! How do you (anyone?) make “Raw Milk Cheese”? I’ve been making my own Yogurt for years and have wanted to know how to make Cottage Cheese also. Thanks. Homemade ricotta cheese is really simple and SOOO delicious! Heat 4 cups milk (I use whole milk, but you could use 2%) 1/2 tsp. Kosher salt to a soft boil and remove from heat. Add 2 Tbsp. white vinegar and let sit undisturbed for 2 minutes. Slowly stir with a wooden spoon until curds separate and a clear-ish liquid is seen. Pour into a sieve lined with damp cheesecloth and set over a bowl. Leave for 15 minutes (less for a softer cheese). That’s it. You can use immediately and/or refrigerate for up to 5-7 days. Bonus: the clear liquid is whey. I bottle it and use it for smoothies, in pancake batter and anywhere you might use buttermilk. Fewer calories than buttermilk, but same probiotic effect. Just discovered your site, can’t wait to get started! Like you, I thought we were doing fairly well already. I still have a few processed things in the pantry, and will have to wean my honey from raw sugar in his coffee. He might not mind the switch to honey. Ha! 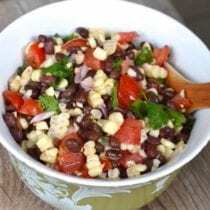 I’m going to make this bean salad for dinner tonight, with salad and salmon. Thanks for the recipe! A good way to “fake” soaking dried beans is to boil them for 30 minutes and then drain. A pressure cooker is a fantastic way to cook dried beans without having to soak. A Crock pot also works well for cooking beans – start soaked (or “fake” soaked beans) in a crock pot with plenty of liquid and a (locally raised) ham hock. Let it cook on low all day, and you have a big pot of beans that can then be eaten on for several meals. Cool story it is surely. My girlfriend has been seeking for this update. I just made this, but substituted frozen corn and cilantro. Yummy! It’s more of a “dump in a container with a lid and shake” type of recipe. Love it! I found a great way to cook corn..as I used to boil mine as well, but never will do that again. You bring water to boil..then add 2 tbsp sugar and 2 tbsp white vingear. Add corn. Cover with lid and remove from heat. Cook for 3-5 minutes. I usually do 5 minutes. The corn is cooked perfectly! I know this is a super old post, however. You don’t have to cook fresh corn at all, we always eat ours raw off the cob and it is sooo yummy. We also like frozen corn and peas in our lunches. When we do cook corn we don’t boil it either (unless it’s going into soup) we simply put it in the microwave in its covers and cook on high for a few minutes. What do you serve this with? Do you have an entrée or meat that it goes well with? I can’t wait to try it! It is super versatile but would be great with Lisa’s enchiladas: https://www.100daysofrealfood.com/2010/04/14/recipe-chicken-enchiladas/. Do you have to cook the black beans if they are canned? Or do you only have to cook them if you are using dry beans? Thanks! Hi Danielle. Nope canned beans are fully cooked. Just rinse them. Hi, I live in a tiny town and the closest “Whole Foods” style store is almost 200 miles away roundtrip. It’s just not feasible for us to go there. We only have 3 grocery stores in our area: Walmart, Meijers, and Kroger. I don’t eat meat, so that’s not a problem, but we don’t have a farmers market with local food. Is there any way my family can still eat all real food? Hi Stephanie. Yes yes! :) Just do your very best as your shop even with limited resources and avoid that processed stuff as much as possible. You might find it difficult to follow all the rules especially when it comes to local foods, but even stores like Walmart are getting better about what they stock….and I find Kroger to be particularly responsive to customer demand. Don’t give up if you find one particular rule difficult, just work around it. Strive simply to do better…you do not need to be perfect. You will find our FAQ pages helpful: https://www.100daysofrealfood.com/frequently-asked-questions/. I know this response is very late, but I can get all the real and organic food I need at Meijer and/or Kroger. Meijer especially has a great organic selection. love this recipe — definitely use cilantro — i made it for a party and put it in the center of a ring of guacamole — served with tortilla chips — so you could get a bit of guac and some of this on a chip — it was great and pretty, too! Hi Lisa, this looks like a great side dish. Is there any particular type of corn you use? I’ve read that corn is a GMO food and not sure if it was safe to eat. Thank you! I use canned organic corn and rinse it well and it works fine. Thank you for your response. Does it say non-gmo on the cans? I believe al organic produce is nonGMO. So hard to find organic corn though. Even Whole Foods doesn’t have it. Corn has a lot of GMO so that’s why I avoid it. You can buy organic frozen, but it’s not the same as fresh. Easy and delicious! This will definitely be a regular dish at our house. Served it as a side with quesadillas. The 2.5 cups of beans is measured cooked, right? Love this blog so much!!! Just an FYI, Eden brand also makes canned organic black beans with no salt added. 15mg sodium can’t wait to try this recipe! Thanks!!! !